Home › Coaching › Why Doesn't Johnny Practice Any More? Basketball Coaching: Why Doesn't Johnny Practice Any More? 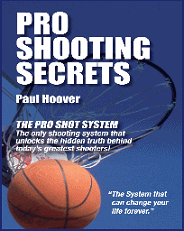 Coach Paul Hoover's Pro Shot Shooting System is an advanced shooting program based on biomechanics and mental focus. The System is currently being employed by thousands of professional, collegiate and high school players and hundreds of AAU, high school and collegiate teams. Paul truly believes that the majority of today's coaches don't teach concepts displayed by the best college and professional shooters on a daily basis, and this is the reason why the majority of youth and high school players continually struggle with their shooting. His site is designed to educate players, parents and coaches about not only the Pro Shot Shooting System, but also the past, present, and future regarding the art of shooting. Anyone with open mind will improve their shooting by learning new concepts and techniques from their videos, articles, and eBook. Get the FREE eBook! Yesterday I was on a coaching internet forum and I had many coaches complain that players aren't spending the hours practicing their skills that they did a decade ago. They claimed that there is a glaring lack of dedication. I 100% agree that today's players have a tremendous amount of distractions. One coach made the observation that a few decades ago you could go shoot around and get away from all distractions. With texting and cell phones, the distractions are always a few inches away. Technology has hurt shooting and basketball skills in general. Remember the old days that if you stayed inside a good amount of time you were considered a freak. Today if you spend time outside and shoot in the driveway, you are now THAT freak. "Look at that kid. He must have no good computer games. What a shame." Boy, have times changed. I often tell players in my camps that if your thumbs are the strongest muscle in your body, you're simply not a basketball player. Technology is not going away. It is here to stay. So what can we do to get Johnny and Susie back in the gym? You would think young players would be working on their shooting constantly. I mean lets face it, you don't need an MIT degree to understand that 3 is worth more than 2. Think again. I believe a large reason that players don't work on their shooting skills is because many AAU and traveling basketball teams don't focus on hitting the open man. Think of it this way--what are the two biggest offensive areas lacking today. Post play and shooting. Why? One reason is that you are dependent on a teammate getting you the ball. Because many AAU teams lack a great amount of practice time, players often focus in games at attacking the basket and don't always hit the open post man or shooter. After awhile, these open players get disgruntled and start playing like the remainder of their teammates. Please understand that I do believe there are many quality AAU coaches that run solid programs in getting open players the ball. Unfortunately there are others that are based on 1 on 1 play. Parents and high school coaches need to find the right traveling program for the player and not just the most convenient. AAU is not just about exposure but also player development. I believe players will spend more time in the gym practicing if they believe they can actually contribute. Opportunities breed success. I truly believe one of the greatest reasons players stay away from the practice court is because they haven't had shooting success in the past. Success breeds interest and failure breeds apathy. Its really that simple. In life, everyone wants to see improvement. And if we don't see any improvement often times our attitudes go sour. But here's where I think different than many coaches. I believe the reason players don't see improvement is because the mechanics that are being taught don't work. I have said this before and I will say it again--I truly believe 90% of what is being taught out there in regards to shooting instruction simply is outdated and no longer works. And yet I see coaches everyday teaching these ways and they complain that their players can't shoot. They can't shoot because it doesn't work. Its mechanically incorrect AND uncomfortable. In the 1950's players used the one handed push shot and for that reason they squared their feet to the basket to achieve more power. Oscar Robertson came along in 1960 and started turning the body and squaring the shooting shoulder and hip which gave him more accuracy and less tension. Soon the turn became the norm in the NBA (Maravich, Rick Barry, Bird, Jordan, Mullin) and every great shooter in the NBA and WNBA now do this when shooting (check out Maya Moore's shot). But what do 95% of high school coaches teach? Ten toes to the basket. Shooting straight up and down is biomechanically incorrect. Not dipping the ball is biomechanically incorrect. And yet I see coaches teach these aspects every day. I guarantee a player that sees the tiniest little improvement will get excited and spend more time on the practice court. I constantly hear high school coaches that say, "I open up the gym, but nobody comes." Trust me, I understanding sharing athletes can be difficult. Still, there has to be a way to get players into the gym to hone their skills. I truly believe if a player fails to show up to shoot then that player doesn't care, is too busy or doesn't respect the coach or team as a whole. I always believed in the "gym rat" and still do to this day. I made sure players that spent a good amount of time were awarded, praised and played in the game as well. Many coaches fall in love with "eye candy" of the great athlete and believe that's the way to win. I think you can win some games with great athletes, but if you lack skill development throughout your program, I believe you will fall short in the long run. I have a saying that I tell my players constantly. "You're either getting better or getting worse. You never stay the same." Coaches have to be adamant about telling players the importance of practicing on their own. Players actually want discipline and may not always live in a disciplined structure at home. Keep "reminding" them that they must improve on their own. They will get it sooner or later. A good friend of mine Herb Welling has a great saying--"Focus on reps and it will get you a rep." Herb's 100% correct. Some how I believe today's players can get back on the practice court but they might need to be coaxed and encouraged. Players will also practice more if they believe there is a prize at the end of the rainbow.